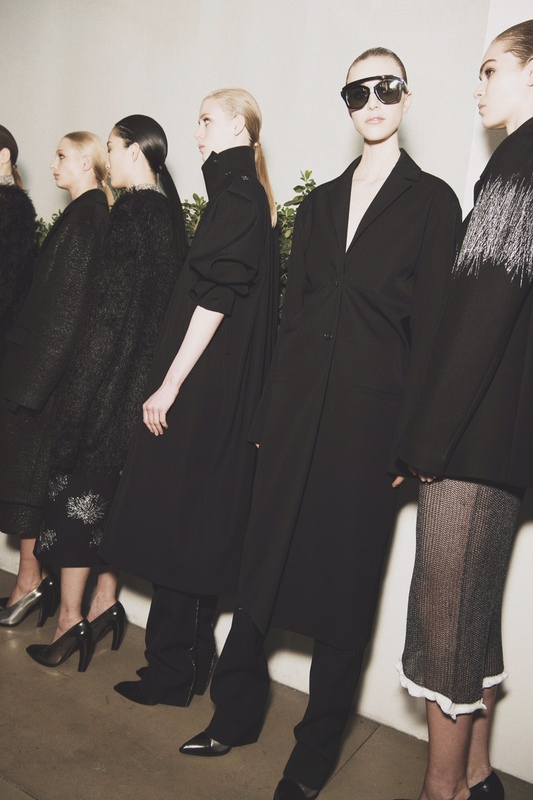 MILAN – Jil Sander: Rodolfo Paglialunga said his fourth womenswear collection at the fashion house is his favourite to date as he took the looks to a new level with clingy designs that maintained the brand’s minimalistic roots. “I put my touch on this collection more than the others. I feel more comfortable,” the designer said backstage. Fittingly, he staged the runway show to haunting music from the Under the Skin 2013 movie soundtrack. The collections ruching gave a sense of kinetic movement to body-clinging monochromatic dresses and skirts that finished below the knee. A white blouse tucked into a high-waist skirt that reached to the bosom for a one-piece effect, while an asymmetrical dress balanced a bare shoulder and arm with an elongated sleeve. Paglialunga added drama to the collection with netting or light chainmail along the hemline of knitwear dresses, and scratches of silver along trouser legs, catching the eye with each step. Jackets and coats were tied in the back, keeping in place a series of pleats. The dress silhouette was often clingy while the coats were more ample than fitted. Trouser lengths varied, including mid-calf hemlines. The colour palette was sober gray and black with some white and metallic shades of pink, gold and silver. Normally, Jil Sander is neither here nor there but I liked this one. This entry was posted in MFW, Trend Reports and tagged aw16, Jil Sander, mfw, milan, milan fashion week. Bookmark the permalink.